Our mentoring program for physics exchange students, done by students. Your fellow is your first friend at TUM. Our fellow program matches physics exchange students with our current students (so-called fellows), to offer incoming students assistance in any questions regarding their studies at TUM as well as their stay in Munich and to help them feel at home as soon as possible. Our fellows are the first friends our exchange students have at TUM and a great opportunity to quickly enlarge their network. 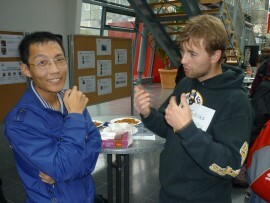 Fellows and incoming exchange students can meet regularly. Beyond this, the department arranges a get-together right after the welcoming event for physics exchange students, where all the group can get to know each other. Would you like to have a fellow? Please let the departmental exchange coordinator know it, including in your email your arrival date in Munich and information about your interests, leisure activities and hobbies. Your email address will be shared with other fellows and incoming exchange students.